Tis the season for giving. For dog parents everywhere, your list of who’s good will always include your furry best friend. Yet, it can be a challenge to find something new and unique that is also special. Don’t succumb to a holiday panic attack! We’ve got you covered. Our below gift guide includes presents for every need. Gifts that are yummy and gifts that will make your dog shine. Gifts for the fashion hound, the canine Einstein, and the couch potato. We even threw in something shiny for hardworking dog moms and dads, too. Yes, the Linda Winks Little Dot Leash is extravagant — but you’re worth it, and so is your dog. It’s the only accessory you’ll need whether you’re strolling around town or going to a black-tie dog-friendly event. 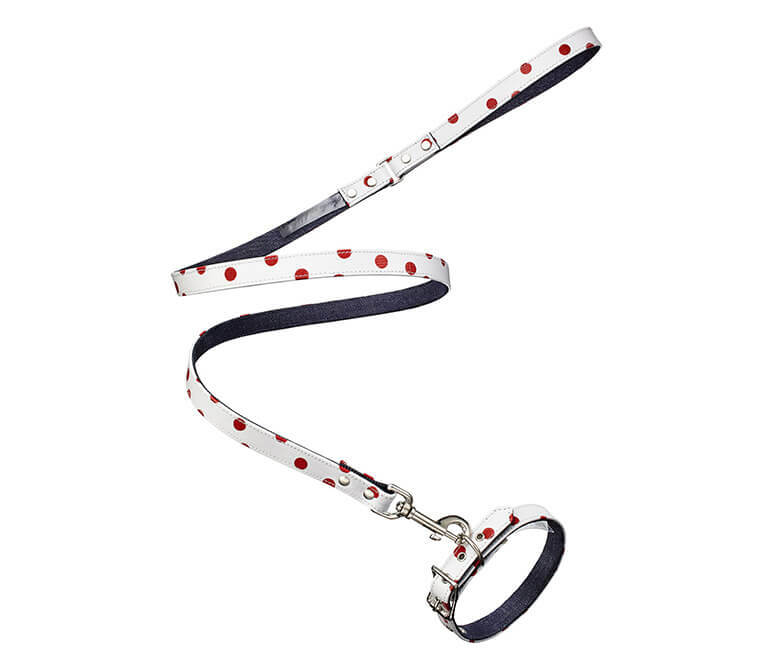 The set includes a matching collar and leash made from pre-washed cotton denim on one side and white faux leather with red dots on the other side. Hardware is silver toned. Created by iconic stylist Linda Rodin and inspired by her dog Winks, the line Linda Winks is a timeless brand that will be sure to make both dog parents and their sidekicks happy (and fashionable) for years to come. The leash measures 52″ long and is .75″ wide, while the collar is 18.25″ long and is .75″ wide, with five holes for sizing. 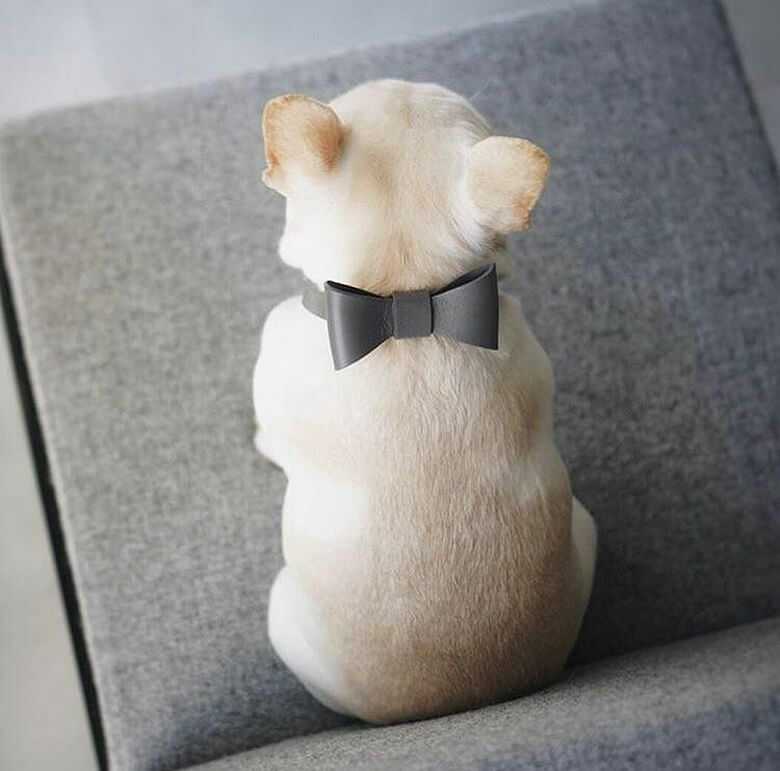 The Pipolli Leather Collar with Removable Bow are adorable and elegant — which is hard to do! Made from quality Italian leather that’s smooth as butter and durable hardware, they are handcrafted in Los Angeles. The company is named after the owners’ “two amazing French Bulldogs” Piggy and Polly. The modern design is inspired by the minimalism of Scandinavian Design. For those dog moms out there, Carrie Cramer necklaces will help keep you sparkle-ready for any holiday party. 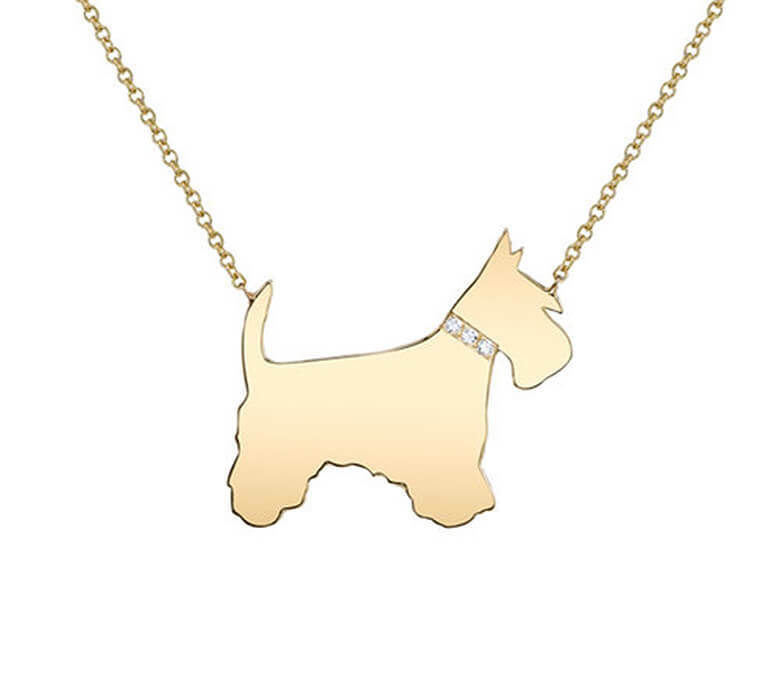 Created by stylist Carrie Cramer, the longtime jewelry collector combined her passion of jewelry and styling to create these luxury dog necklaces, with her original line inspired by her Schnauzer Atticus. Her original collection now features 31 dog breed necklaces, along with the option to create a custom dog silhouette. Each one is available in sterling silver; yellow, white and rose gold; and plated yellow gold. Customers can also choose to have with our without a diamond collar, as well as all-over pavé. Keeping up with your dog’s dental health is one of the kindest acts you can do for baby. Dental disease isn’t only smelly — it can also be extremely painful both for your dog and your bank account. The Bye, Bye Dog Breath Dental Kit gives you the tools to keep your dog’s teeth gleaming and give her a reason to smile. 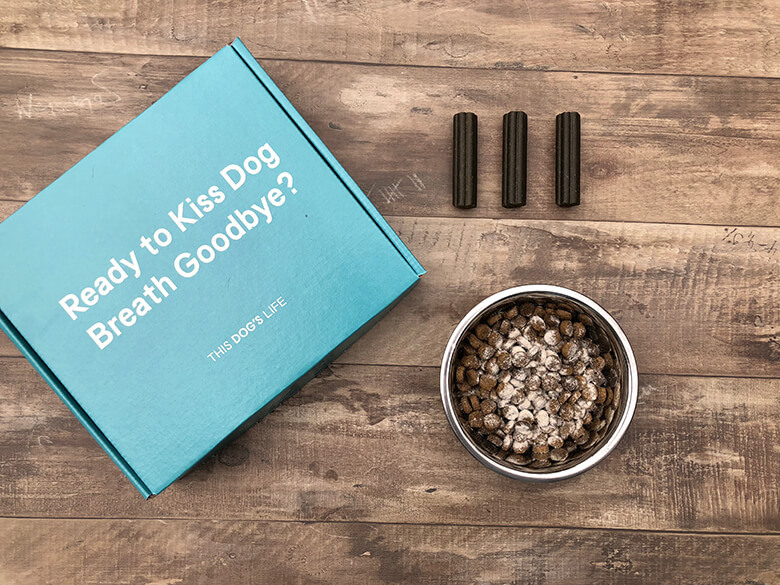 That’s because the kit includes our Bye, Bye Dog Breath Dental Sticks. These dual-layered chew sticks will help remove plaque and prevent tartar, which lead to dental disease, while the stick’s inner core keeps gums health and breath fresh. Your dog will be in chewing bliss while cleaning her own teeth. Bye, Bye Dog Breath Dental Powder is the easiest way to support your dog’s dental health — just sprinkle it on your dog’s food. A little goes a long way as it’s packed with minerals to prevent plaque from forming and antioxidants like cranberry that target the bacteria that leads to dental disease. For the home that could appear in the pages of an interior design magazine, check out the MiaCara Iconic Circular Wood Dog Lounge. The Covo dog lounge is a work of art that will elevate your home décor while giving your dog a cozy burrow for some fashionable snoozing. 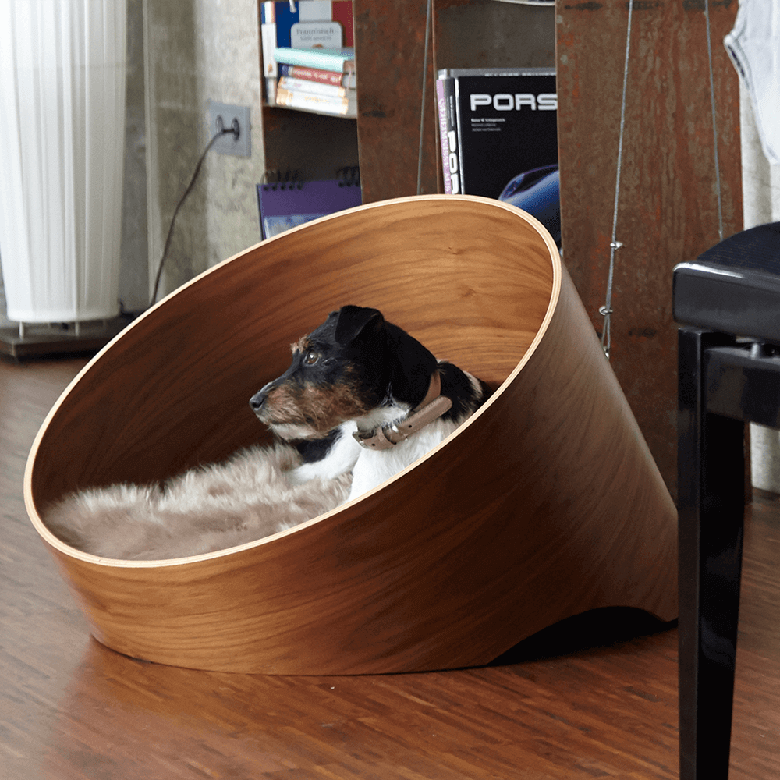 Designed by architect and interior designer Uta Cossman, it’s made from bent walnut plywood in a shape that offers a protected space for dogs to nest. It’s super strong and easy to clean. It comes with a supportive, open cell foam cushion with removable, washable cover. Both inner cushion and outer cover are machine washable. The inner foam cushion can be machine dried, or use the spin cycle to remove water and let air dry. Covers can be machine washed or dry cleaned, but do not put in the dryer. Covers are available in faux fur or Hemp fabric. Available in Small and Medium and in Ash and Walnut. 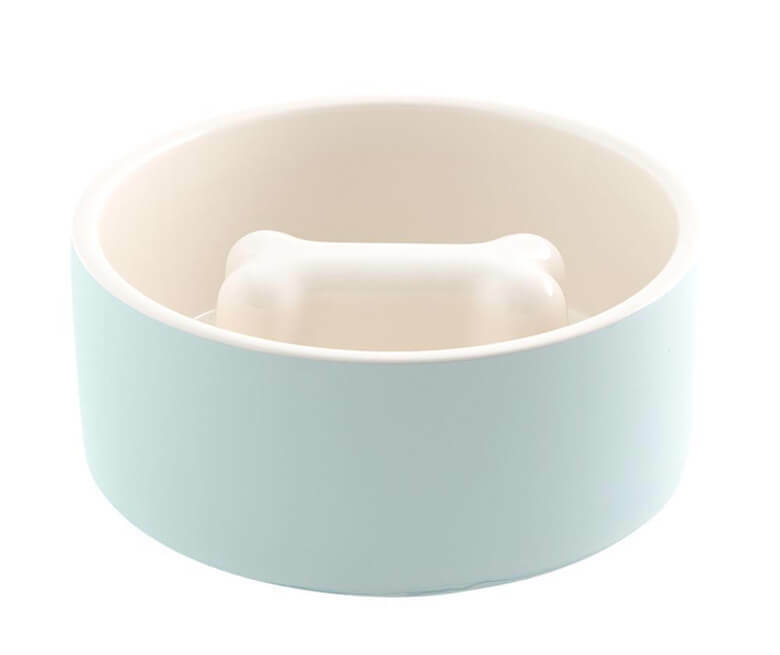 The Slow Feeder Ceramic Dog Bowl by Magisso is an elegant dog bowl that’s perfect for dogs who hoover their food. Studies have shown that eating too fast can lead to vomiting, choking, and worst of all, a serious condition called bloat. Magisso has come up with an ingenious design that forces your dog to eat, shall we say, a bit more delicately, leading to better indigestion and healthier teeth. A three-dimensional bone or heart on the inside of the bowl is the trick as dogs have to eat around it. The bowl is made from a special ceramic that minimizes bacteria and keeps food fresh and water cool. Just soak for 60 seconds to activate cooling, and your food and water will be fresh for hours. Available in three different sizes — XS/S, Medium and Large — and three different colors: Heavenly Blue, Blush and Ebony. Not only is this collection ridiculously cute, the company, over the past four years, has raised and donated $150,000 to rescue groups worldwide. 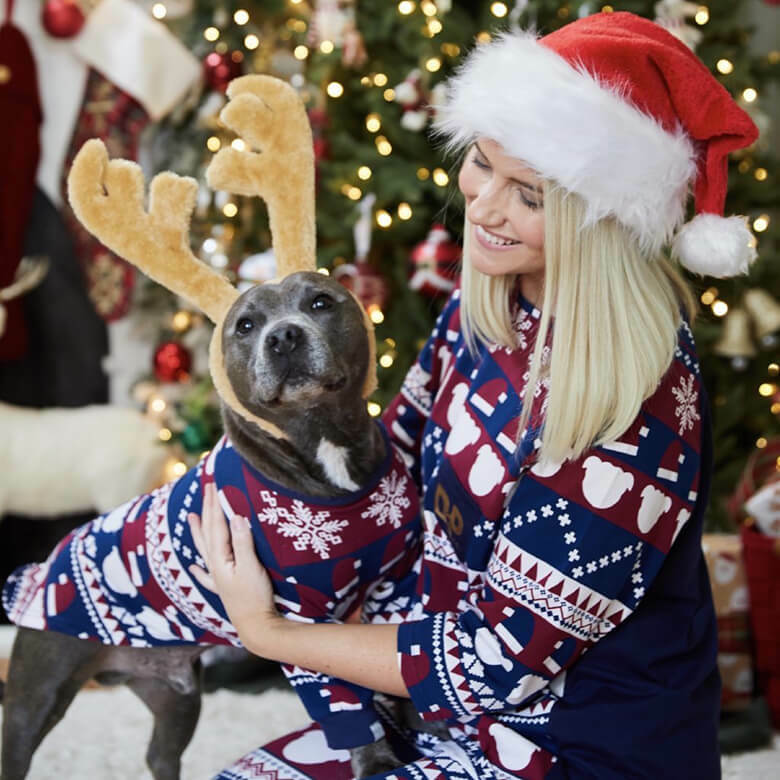 When you purchase a Jingle Bullies Pajama, 20% of proceeds will be donated to rescues, making these the perfect gift to give for this holiday season. 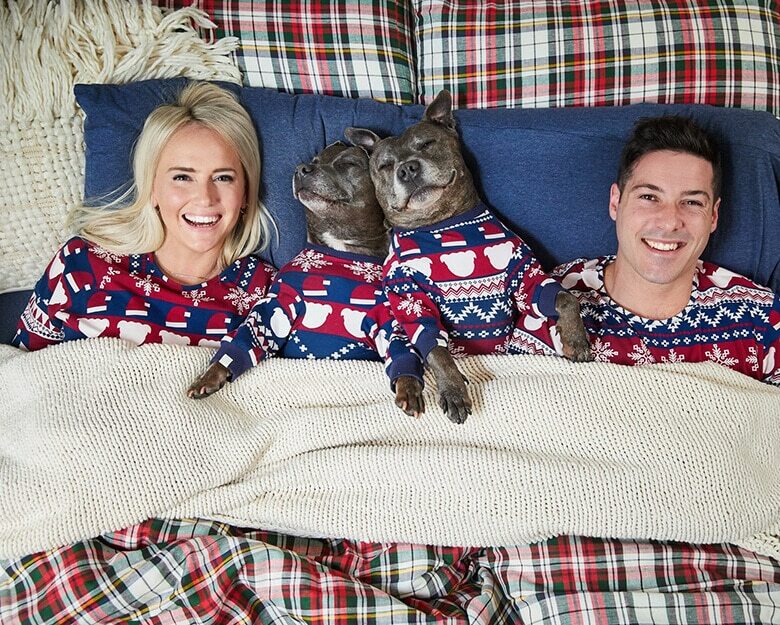 The line offers matching PJs for both you and your dogs. Made from soft, stretchy cotton elastane, they are easy to put on and totally snuggable. Dog versions come in a onesie and a “pyjama” tee. Human PJs are available in sets with long bottoms for men and women, along with a short set also for females. Human sizes range from XS to XL and dogs sizes range from XXS (for dogs 15-30 pounds) to Large (77-110 pounds). With a slogan like “Every Pound Saves a Hound” you can’t go wrong. The Good Brew Bundle is the giving way to survive, er, enjoy the holiday season. 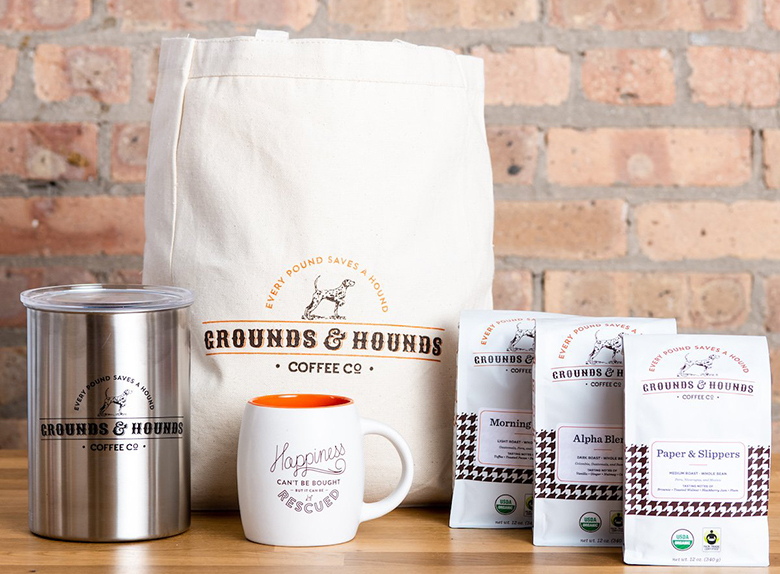 With 20% of their profits going to rescue organizations to help fund animal rescue organizations throughout the country, you’ll be doing a good deed — and getting a great cup of coffee. Their coffee is 100% fair trade and 100% organic certified green coffee from farmers who only use natural agriculture techniques. To preserve the unique qualities of their different beans, they roast them in small batches. You can choose individually from light, medium and dark roast, as well as blends and single origin beans. With all the recalls on contaminated, commercial dog food, many dog parents have grown wary of even the highest rated wet and dry dog food. Even brands that are given the all clear contain unnecessary additives and preservatives. While cooking for your dog is actually often less expensive than the highest quality commercial dog food, the problem is that many dog parents barely have time to cook for themselves and their family, let alone the dog. So how do you give your dogs the best food for them as well as food that they truly love? The answer is subscription dog food. 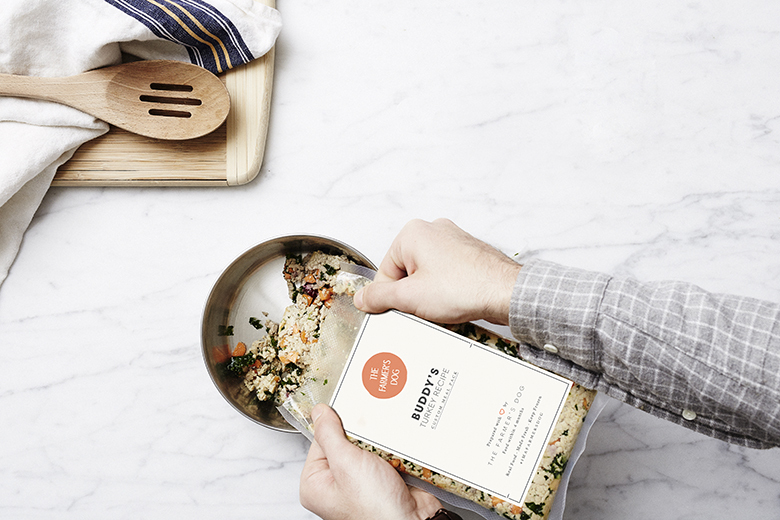 Brands like NomNomNow, The Farmer’s Dog, Ollie and PetPlate, do the home cooking for you, using human-grade food and fresh ingredients. It’s the modern answer to farm to table — for canines — for dog parents who just don’t have the time, or the confidence, to cook. There’s usually a variety of recipes, so you can rotate the protein while keeping your dog drooling for more. Meals are nutritionally complete with any needed supplements already added and delivered right to your front door, fully cooked. Put one package at a time in the refrigerator and freeze the rest. Just defrost overnight, spoon into your dog’s bowl, microwave for a few seconds to warm, and you’re done. Happy dog, happy dog parent, happy house. Inspired by a Seattle couple’s love for their Corgi, Odin, these Up Dog Toys will keep your dog occupied for hours — and look good while doing it. Designed like an object de’art, it’s the one toy you won’t mind littering (or decorating) your floor. 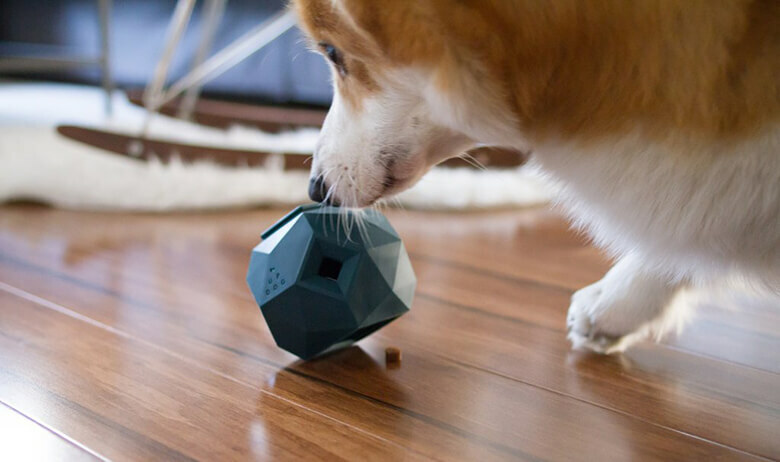 The Odin is an interactive, treat-dispensing, toy with a modular design. You can attach two Odins together to change the shape and keep your dog interested. Treats go in the top and bottom flaps. The angular design makes the ball roll erratically as your dog pushes it and treats fall out. The rubber-like material it’s made from is easy on floors and on your dog’s teeth. Available in slate grey, emerald blue, rose quartz and light gray. Bocce’s Bakery is named after a somewhat rotund mutt named Bocce who was told at a veterinary checkup to lose some of his extra poundage. It was during this depressing vet visit that his human realized all the junk that was in his commercial food and treats — and decided to do better for Bocce. 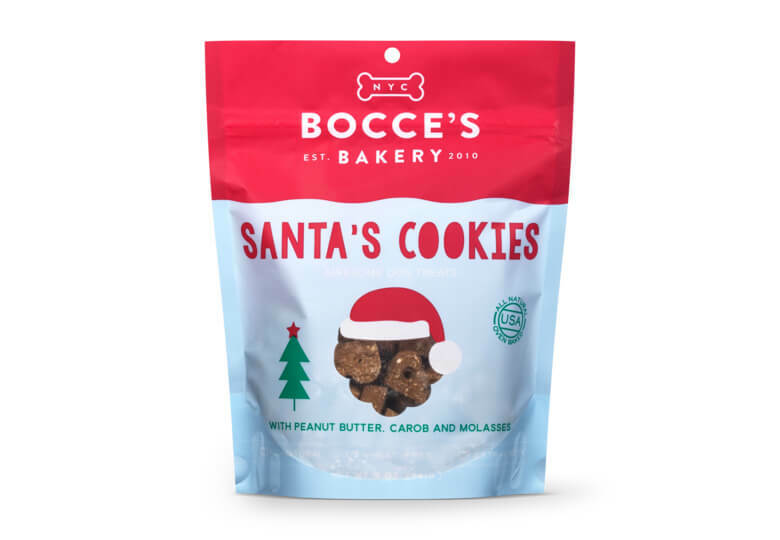 Using only organic, natural ingredients, with Bocce as biscuit-taster, these treats are still baked by hand in small batches. Every flavor has even been giving Bocce’s paw of approval — and he even managed to slim down. The company is known for its yummy flavors like Peanut Butter and Bacon, Bedtime Tea and Banana Split. The all-natural Holiday Assorted Box from Bocce’s Bakery contains some of their bestsellers: Mint Coco Chip, Shepherd’s Pie and Lumps of Coal.